Mobile is widening its lead over desktop search. 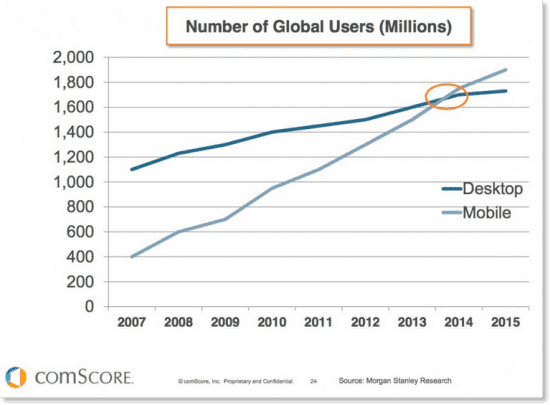 The number of mobile device users surpassed desktop in early 2014, and that trajectory continues to rise. Virtually everyone with a mobile device uses it to find information online. That includes information on products and services they’re interested in buying. In order to meet the needs of mobile users, marketers must optimize their sites for mobile. Local search engine optimization is becoming more important. With the launch of My Business, Google signaled an increasing emphasis on local SEO. Search elements like the searcher’s location in relation to local businesses and customer reviews help determine where businesses place in local search results. Smart local businesses will take advantage of My Business to enhance their position in local search. There are new on-page optimization keys to consider. While keyword density still matters, search engines have begun placing far less emphasis on specific keywords and phrases, and more emphasis on the meaning or intent behind those keywords, according to Forbes. So marketers must monitor on-page items like click-through rates, engagement, social signals and content relevance, and make adjustments as necessary. Micro-moments change how people consume media. Google defines micro-moments as those instants when people reflexively turn to a device to act on a need to learn something, do something, discover something, watch something, or buy something. To take advantage of these moments, businesses must immediately deliver exactly what people are looking for when they are looking. Tools like Facebook Live enable you to post in-the-moment updates and take advantage of the popularity of live video content. With the likes of Google, Facebook and Twitter releasing new feature after new feature designed to improve the overall experience of their users, marketers must stay current with the changes and adapt. Those that do will have a competitive advantage. Those that don’t risk being left in the dust.